The Montreal Canadiens could be playing a dangerous game by not locking up star defencemen P.K. Subban as the two sides head to salary arbitration. First item of business: don't freak out over salary-arbitration submissions. Players and agents (often with help from NHLPA advisors) usually raise the bar high. Teams (often with help from the NHL and a law firm on retainer for this purpose) usually aim low. 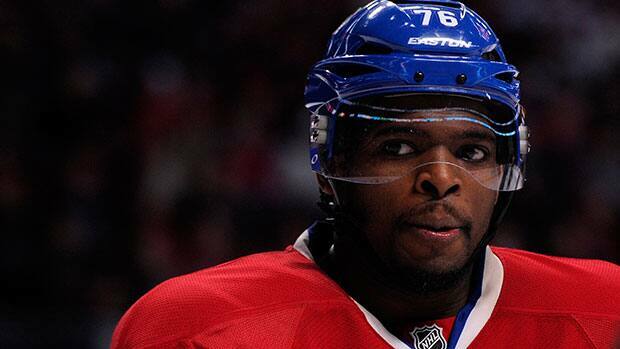 So when, as reported Wednesday, the Montreal Canadiens offer restricted free agent P.K. Subban a one-year deal worth $5.25 million US and Subban's agency (Newport) counters with $8.5 million, recognize that neither side expects its number to hold. The arbitrator has a wide berth to make a ruling, should we even get that far. That's why, when agent Don Meehan was asked Wednesday night on Prime Time Sports if Subban was "mad" at the Canadiens, he immediately said "No." Montreal GM Marc Bergevin does not talk about contracts, so it's hard to pin down his feelings. But Meehan expects the two sides to connect Thursday, with the hearing scheduled for Friday. I can't believe this actually goes to a hearing, but this is starting to look like 2011 all over again. Three years ago, Shea Weber, just shy of age 26, was two seasons from unrestricted free agency. Coming off a bridge deal with an average annual value of $4.5 million, the defenceman filed for arbitration. Nashville offered $4.75 million -- a surprising lowball, even by arbitration standards. They couldn't reach a settlement beforehand, but the team was careful not to offend a franchise player during the hearing. Weber was awarded $7.5 million, which remains the arbitration record. Subban, who just turned 25, is two years from being eligible for unrestricted free agency. Weber played about 150 more games than Subban has to this point, and was a bigger goal scorer. But, in the two seasons immediately prior to their arbitrations, both players had 91 points. Weber's came in 160 games. Subban's total was 124, because of the lockout. Bet your first born that's going to come up here. So is Subban's Norris Trophy. Weber hasn't won it -- yet. Does anyone want to bet against a new record? And, remember, if there isn't an extension, Montreal has to qualify Subban at that number next season. Was Weber mad at the Predators? "No," agent Jarrett Bousquet said Wednesday. "We made sure he was prepared and understood it is part of the business." Many GMs will tell you offer-sheeting Montreal is stupid because the team is a financial powerhouse, although there are varying opinions on whether or not it is worth it to screw up the Canadiens' cap situation. But what I do believe is that you can't tempt fate. Subban's already been through one contract dispute. Weber's relationship with Nashville was just about perfect prior to arbitration. And, even if he did understand the low offer was "just business," he made sure to use business to his full advantage one year later. There are rumours the two sides are having all sorts of trouble reaching a long-term deal, and Meehan didn't throw cold water on that theory in his radio interview. Maybe the solution is a shorter deal that gives both sides another shot at this when Subban is 29 or 30, still in prime earning years for a defenceman. While Meehan added that Subban hasn't "instructed us to attend to" making Subban the NHL's highest-paid blue-liner (Weber's $7.8M average annual value is tops), Canadiens fans are getting increasingly nervous. That fatalism grew when Subban told The National Post he's thought about the idea of playing for his hometown Maple Leafs. "It's far too soon to have any thoughts," of Subban leaving Montreal, Meehan said. "We have a long period of time before P.K. becomes a UFA and really our objective is to concentrate our best efforts in trying to reach a settlement with Montreal on a long-term contract." It's interesting watching Bergevin and Subban. The GM has shown he's unafraid to make bold moves, whether the fans support him or not. So far, he's been very successful. But Subban is also fearless. He believes 100 per cent he's going to accomplish everything he wants, no matter who stands in his way. I believe he wants to stay in Montreal -- but on his terms, whatever they may be. The closer you get to unrestricted free agency, the more the leverage slides to the player. Especially a player of Subban's ability. Three years ago, a cornerstone player took control of the system. Will Montreal allow the same thing to happen?